This year we decided to stay domestic for Spring break and my husband suggested we also try to work in a visit to a National park or monument. Because it's consistently warm in AZ and Phoenix offers great flight options for "snow birds" in the Spring, we choose to visit Scottsdale and the Grand Canyon. The PHX airport is a hub for connecting flights of all kinds, and Southwest flies there cross country year-round. Rent a car before you leave the Phoenix airport and take the 1/2 hr drive to Scottsdale. You'll want the car for adventuring in the Scottsdale area, and for the roughly 4.5 hour drive to the South rim of the Grand Canyon. It's important to mention that the South rim is open year round, and the North rim is not only harder to get to but closed November through mid-May. RTip: If you want to include whitewater rafting in your itinerary, be aware that rafting tours are only offered April - Oct out of Peach, AZ (which is 2 hrs East of the South rim). Falling rocks, plane crashes and dehydration, oh my! While most of the roughly 800 deaths that have occurred in the Grand Canyon since the 1800's are clear accidents, the majority of those deaths are still somehow morbidly fascinating. Inspired by the 2001 book, Over the Edge: Death in the Grand Canyon, this map, engages us in all the disturbing details. Listed by cause of death and area, these grim endings include failed river crossing attempts, murder, and death by critter. Who knew you could get so lost in a map? Recent renovations only secure this resort as a favorite in Scottsdale. The pool scene is low key and the location is fab for walking. A sandy bottom pool is reminiscent of being at the beach. The room size and balcony offer great privacy, and the expansive lobby is wonderful for just hanging out. RTip: Ask to leave behind your luggage when you head out for an overnight adventure. We left our bags with the bellman at The Scott for 2 days to go North and explore the Grand Canyon. Away from the hustle and bustle of downtown, you’ll find North Scottsdale it’s not exactly a hop, skip and a jump, but if you are willing to make the 15 minute drive there are a lot of great homes for rent in this area. Tucked between the boulder filled mountains, hiking and golfing is king here, and the views are expansive. If you are in a group start with this amenity filled airbnb. As a family look into this higher priced VRBO, and as a couple check out this luxury guest house. RTip: Wherever you end up, consider spending a day at the Four Seasons where an appointment in the spa (they even offer kids treatments) allows you access to the resort all day. The nachos poolside have been described as "life-changing," and pair well with a seasonal margarita. With only eight impeccably designed rooms, this is the ideal option for anyone who is looking for the level of privacy standard in a house rental, but with the custom amenities of a luxury resort. The restaurant is fabulous, and as a guest you can enjoy breakfast for only $10. If you decide to travel to the Grand Canyon, El Tovar offers historical luxury and direct park access. This hotel is perched on the edge of the Grand Canyon inside the South Rim of the National Park. There are less than 80 rooms, of which 12 suites have a view of the canyon, and only a handful of those offer a balcony overlooking the rim. Be sure to book early and before a rate increase, which is inevitable in 2019 after the renovations. RTip: While this historic property undergoes some timely updates (Oct. '18-April '19), the best alternative is The Grand Hotel, at the Grand Canyon. It's only 1 mile from the park entrance and 10 minutes from the South rim trail. The pool and hot tub are a nice way to end the day, and their food is arguably the best in Tusayan. Our favorite hike in Scottsdale is Pinnacle Peak, it's a very worthy hike with beautiful views. The trail is well laid, and manageable for all abilities and ages. Hiking Camelback is not for the faint of heart, but climbing to the summit is more than doable if you are prepared, properly hydrated and up for an adventure. There are two sides of the mountain to climb, the steep and strenuous 1.2 mile Echo Canyon Trail head or the 1.5 mile Cholla Trail, which offers a more gradual climb (that is until you get close to the summit)! There is public parking at both trail heads. Echo Canyon offers facilities like a bathroom and a shady canopy where you can check and double check that you have enough water, you're properly sun-blocked and you've read all the warning signs suggesting you "read the warning signs." The parking lot is often full, but have faith and just keep driving around the roundabout as it turns over quickly. As is the case hiking anywhere in the desert get there early, the sun can become merciless as the day goes on. There will be a cappuccino or cocktail waiting for you at the end, you can do it! RTip: Climb up Echo Canyon and down Cholla. You can reward yourself with lunch or a cocktail at The Phoenician. This luxury resort is a quick walk from the Cholla side of the mountain. From there it's a simple uber back to Echo Canyon where you parked your car. Macdonalds Ranch is the perfect place to feel like a desert cowboy. They offer private horseback rides for 1-2 hours at all skill levels and only 25 minutes from Scottsdale. Family owned since the 50's they raise gentle horses and they treat them well. Make a reservation well in advance or call ahead to may sure they have availability. RTip: Stop by the Scottsdale Target for a great selection of kids cowboy boots to round out their horseback riding experience without blowing all your Lincoln skins. The best way to absorb the enormity of the Grand Canyon isn't to stand at a scenic lookout behind a camera lens, but to do something active. From the South rim you can take an airplane tour, horseback ride, or smooth water raft. Because our kids are little, we choose to see more of the Grand Canyon on a bike ride along the rim. Depending on the season, Bright Angel Bicycles offers several tour options, up to three times a day, and includes rentals, guides and stops to take in the view. We choose the Hermit Road Tour which involves a shuttle, ends at a the Hermit's rest gift shop and takes you along roads otherwise closed to public vehicle traffic. They ask you arrive 1/2 hour early to get fitted for bike and check in, so plan for extra time to drive the 7 miles from Tusayan to the visitor center parking lot. The south entrance station vehicle permit is $30 and even if you've pre-purchased your pass, you still need to show the ranger your permit. While the entrance is open 24 hours there are certain times of the day that the line of cars can get backed way up. RTip: Swipe an extra water bottle. They are my kids favorite swag. When it comes to shopping, we always like to seek out something different, something we can't find at home. This family owned, hand-crafted western wear shop is filled with an amazing assortment of cowboy boots. The price tag is authentic too, but the boots are so fabulous you'll actually wear them again. There is no place in the US I'm more inclined to buy an authentic Pendleton blanket than in Arizona, and they have a store front in Old Town. Although Pendleton was founded in Oregon in the early 1900's, the company's passion for national parks and support of the native Americans translates beautifully into the Arizona landscape. Even on the warmest evening I'd love to cover myself in their signature stripes and sip Chardonnay. We are bound to seek out an olive oil shop whether we're in San Francisco or Minneapolis, and Scottsdale is no exception. This spot has been a favorite of ours over the years, and under new ownership they have undergone a complete renovation. If you are in the area checkout their oil and vinegar pairings and tell owners Paige & Frankie we said hello. While it's not unusual to find Neccos or Raggedy Ann dolls in kitchy shops like this one, Old Town does stock some Arizona exclusive souvenirs, including cactus candy and little outlaw vests. We walked away with the least nostalgic items we could find, including a sensory ball for the pool and a feathered Indian headband. Not surprisingly, you'll have to get in line for breakfast on the weekend. After you get your name on the list, pop in line for drinks at the side bar and go outside to enjoy the AZ sun while you wait for a table. There are six different kinds of Benedict, the staff is super attentive and they serve alcohol. RTip: While they don't take reservations, you can put your name in before you arrive through the nowait app. That's the best way to time your arrival, track your spot in line, and minimize your wait. Not exaggerating everyone recommends, La Grande Orange and for good reason. It’s a fun, gourmet, chic spot that serves everything from delicious breakfast sandwiches to brick oven pizza and sushi. The coffee is incredible and they open at 6:30am so you can stop in before or after your Camelback adventure. It's worth waiting for a coveted spot on the patio by the fire. Start with the shrimp anticuchos and the tableside guacamole, and then be sure to order a variety of tacos & tortas to share. The black bean puree and the poblano grits are incredible sides and every one of the 9 margaritas are fabulous. RTip: While you wait for a table, visit the actual adobe Mission next door. If you say please, the volunteer attendant might let you ring the church bell. This restaurant is settled inside the charming Bespoke B&B in old town Scottsdale. With it's weekly menu of fresh seafood and handmade pasta it's easy to see why it's getting so much press. Make a dinner reservation near sundown, so you can slip into the evening with a craft cocktail under the picturesque patio lights. 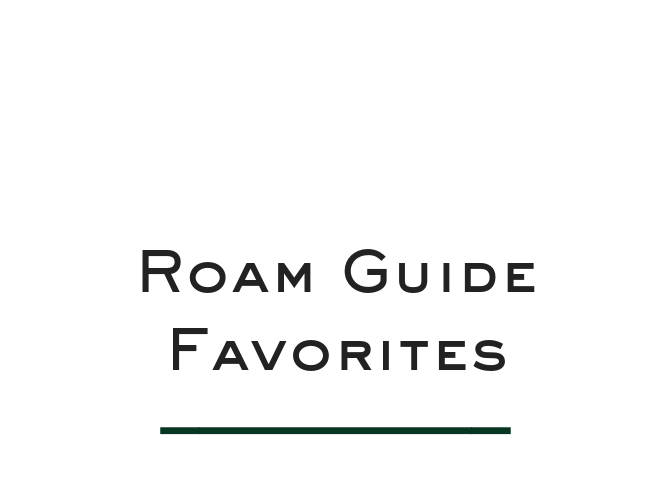 RTip: For more places to eat in this area, check out our Foodie Guide to Arizona, and if you are interested in unique outdoor dinner experiences check out Cloth and Flame for upcoming events. Although not on the direct route to the Grand Canyon, Sedona is a perfect 1/2 way spot for lunch (2.5 hrs between each stop). Serving American fare everyday from 11:30, this neighborhood eatery has fabulous views from inside and out on the patio. You can easily make a meal of the starters or go for a burger, and the house made corn chowder is great. Whatever you decide, be sure to fill your belly because the food is nothing to speak up once you arrive at the National Park. This is the best, and by far most popular, spot to grab a quick breakfast before heading into the Grand Canyon. A to go coffee and bagel sandwich is a great choice, especially if the line of cars into the park entrance is backed up. You can also call to pre-order a box lunch for your day, and the kids version is only $2. A lightweight layer & beanie, a list of great podcasts, a weekend bag and some great pool toys. Next time we're feeling like an active Spring break adventure, we'll head out of Phoenix the other direction to Tanque Verde Ranch. This dude ranch vacation spot has been on our list for a while, and we look forward to the cowboy cookout, horseback adventures and a prickly pear margarita real soon. Cheers to experiencing something new as a family while still finding time to relax.